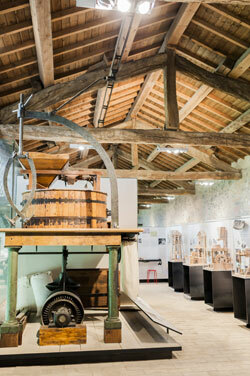 Inside the medieval farming court of Giarola (Collecchio), there is the Pasta Museum, one of the six food museums of Parma province, testifying the story, culture and technology of pasta-making. The visit starts with the wheat, its characteristics and farming methods, ancient tools and documents, all testimonies of the agricultural techniques evolution. Very interesting prototypes and historic iconography, the reconstruction of a mill and a modern ball mill, all tell us about the milling process whereas, small tools, such as rolling pins and the extraordinary variety of the richest Italian collection of “speronelle” (pasta cutters), show us how to make homemade fresh pasta. A real pasta factory, dating back to the first half of the 19th century, enables visitors to take in the whole process of dry pasta production, by means of perfectly restored authentic machinery. The production methods used in an Emilian handcraft laboratory of the past century are evidenced by another group of old machines. One of the first “continuous presses”, whose restoration was sponsored by Storci, lets the visitor know, along with prototypes and videos, the current, state-of-the-art technologies used by industrial pasta factories to guarantee a high quality, lasting product. Next to it, there are over hundred dies tallying with the same number of shapes, a real “art of designing pasta”.